When you're hiring a jazz band for your wedding you want to know that the band you're hiring is going to put in a fantastic performance. We've played at many weddings including esteemed Chap-Hopper Mr B - The Gentleman Rhymer's wedding in Brighton. "Twin and Tonic were absolutely awesome. Really unique, they looked and sounded fantastic. 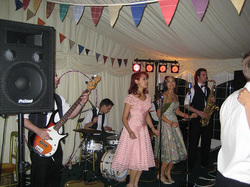 We were delighted to have them perform at our wedding, travelling all the way to Somerset for us. We wanted a really relaxed, informal day and that is what we got. They band are so lovely and friendly, they danced the night away with our friends and family - it was a brilliant evening that we will never forget." - Estelle B.
Enquire and hire a jazz band.